From 25th to 28th June, the representatives of TSU Piestany (Mr. J. Crkon, Mr. D. Hanko and Mr. 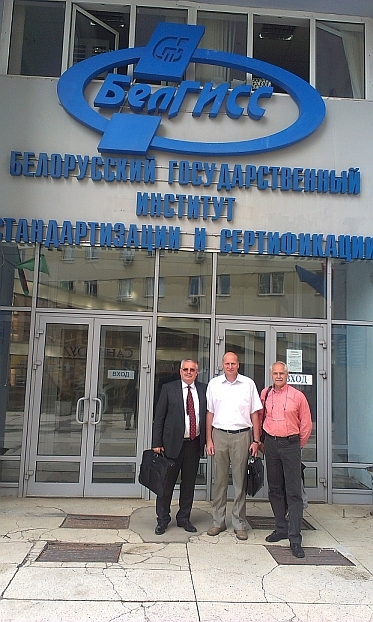 I. Sikomas) visited the BelGISS Institute in Minsk, Belarus. Hereby continues the 10-year tradition of successful cooperation between these two internationally recognized testing institutes. Our representatives made a sight-seeing tour of the institute and they were enabled to look into several laboratories and to become familiar with their activities and technical equipment. During the working meeting they attended an international scientific and practical conference "Customs Union and the common economic area; directing of technical regulations". At the close of the working meeting, the representatives signed a record depicting the goals of mutual cooperation in 2013 in details, accompanied by the individual schedule of shared works by products conformity assessment of Belarusian manufacturing plants according to EU legislation.